"Lower than a King you say… a four!" "Higher than a four you say… a seven!" "Don’t touch the pack, we’ll be right back." Okay, that’s enough of that for the next decade (at least). 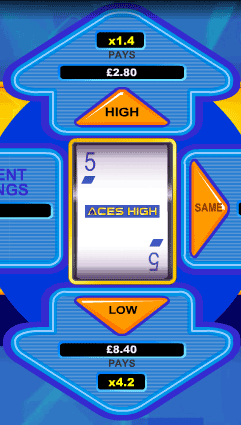 But anyway, what I’m trying to get at here is that Aces High is just like an online version of Play Your Cards Right. 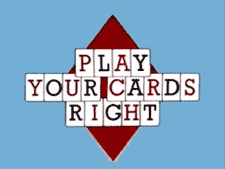 If you’ve never heard of Play Your cards Right, it’s either a bad thing or a very good thing; it’s tricky to say. Nonetheless, the Aces High online game simply involves guessing hi or lo on consecutive playing cards. Simple really. 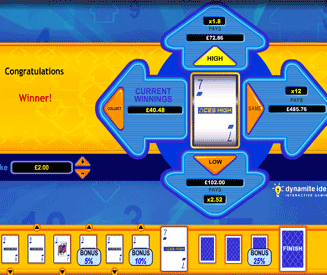 There are other games like Hi Lo Poker and Hi Lo Gambler that involve guessing higher and lower on playing cards. 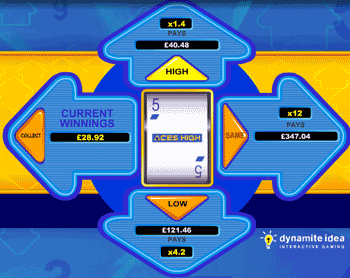 However, Aces High is the closest you’re going to get to playing Play Your Cards Right online. Guessing hi or lo on playing cards is fun up to a point, and unfortunately that "point" comes after about 2 or 3 games. There’s no real edge to the Aces High game. Sure it plays well and racking up a big win is exciting, but there are other games out there that do a much better job of this game format. If you’re the kind of person that prefers no-nonsense lager and a pack of salted peanuts, Aces High is exactly what you’d want from a hi lo real money game. On the other hand, if a cocktail and a bowl of mixed flavour crisps is more "you", try Hi Lo Poker or 4 Play Hi Lo Bingo instead. There’s nothing wrong with Aces High, it just doesn’t do anything impressive. Choose which playing card value you want to start with. If you guess correctly, collect your winnings or play on for a much bigger win. If you and a friend had to make up a "hi lo" game with a deck of cards, you would end up with almost the exact same rules and format as "Aces High". It’s about as straightforward as it gets. Choose your starting card. You can select any value card to start the game with. Guess high, low or same. As the name of the game suggests, aces are high. If you guess incorrectly, the game is over and you lose. If you guess correctly, you can collect or gamble your winnings by guessing high, low or same (like before) on the next card. You can gamble up to 10 times before the game ends. There are no options to shuffle or switch the current card for a better one at any point; you’re stuck with what you’re given. After set numbers of correct consecutive guesses you will win bonuses. These bonuses in Aces High will increase your winnings by the percentage as indicated. So for example, if on your 9th correct guess you would have normally won $100, the 25% bonus will increase this to $125. Note: Some versions of Aces High are different to others. The intervals between bonuses can vary from one real money games site to the next. The above 3, 5, 9 structure is the most common though. The less likely the outcome, the bigger the payout. The more likely the outcome, the smaller the payout. The following table highlights the payout multipliers for guessing hi or lo on each starting card. Fact: The payout for guessing "same" on any starting card is 12.6x.